Melinda Beck is an illustrator and graphic designer living in Brooklyn. 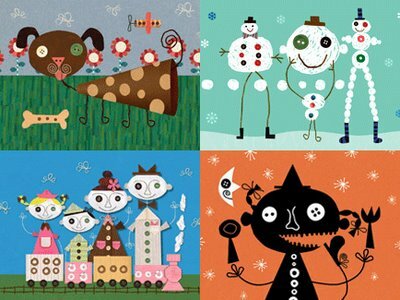 Anyone having a little toddler and watching Noggin, like us, all the time, is very well familiar with her work as she did beautiful animated tv spots for the Noggin network. Love her style. I absolutely love these illustrations! These are wonderful illustrations; I’ll have to show my kids. Thanks for pointing them out. suh-weet, I could never find out the credits for those graphics, and I’ve had it in the back of my head for like two years now to chase down the Noggin creative directors and find out who did the work. It’s really wonderful stuff, thanks!